CURE-funded researchers are using a novel technique to discover ways to predict patients at an increased risk of Sudden Unexpected Death in Epilepsy (SUDEP). Dr. Lori Isom, her team, and co-investigator Dr. Jack Parent at the University of Michigan are transforming skin cells from patients with developmental and epileptic encephalopathy (DEE) syndromes into induced pluripotent stem cells (iPSCs). The team then generates cardiac cells from the iPSCs which retain the patients’ exact genetic information. These unique, patient-specific cardiac cells are used as models to understand if DEE-associated genes play a role in causing heart abnormalities which may lead to SUDEP. The team also hopes to develop measurable indicators, known as biomarkers, of SUDEP risk. Severe DEE syndromes, such as Dravet syndrome, are associated with a high incidence of SUDEP. It is estimated that up to 20% of patients with Dravet syndrome die from SUDEP.1 There is still much to be understood about the mechanisms of SUDEP and how to predict who is at risk for it. 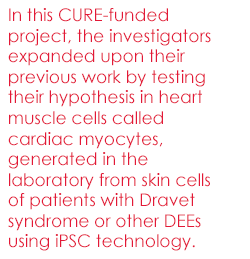 In this CURE-funded project, the investigators expanded upon their previous work by testing their hypothesis in heart muscle cells called cardiac myocytes, generated in the laboratory from skin cells of patients with Dravet syndrome or other DEEs using iPSC technology. This Nobel Prize-winning technology involves obtaining skin or blood cells from patients and converting them to iPSCs. These are stem cells that can be converted into almost any specialized cell type in the body, such as heart, muscle, pancreatic, or neuronal cells. 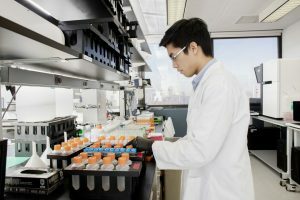 The cells are patient-specific, meaning they retain the unique genetic make-up of the patient they originated from, allowing investigators to study cell types which would otherwise be very difficult or impossible to obtain from a living patient. Dr. Isom, Dr. Parent, and their colleagues previously used iPSC technology to generate heart muscle cells from four patients with variants in the SCN1A gene and found increased sodium currents and spontaneous contraction rates in these cells, suggesting cardiac electrical dysfunction.5 Cardiac abnormalities were subsequently found in the patient with the highest increase in sodium current.5 These data suggest that iPSC-cardiac cells may be useful models for identifying and developing biomarkers, such as increased sodium current, as indicators of SUDEP risk. The investigators used the same technique to study variants in the SCN1B and SCN8A genes. The team observed that iPSC-cardiac myocytes derived from a patient with SCN1B Dravet syndrome had increased sodium currents similar to those seen in iPSC-cardiac myocytes from the patient with SCN1A Dravet syndrome, suggesting that variants in these two different genes could cause heart abnormalities through similar mechanisms. Preliminary data in iPSC-cardiac myocytes from patients with DEE caused by variants in SCN8A, suggest that these cells have altered beating rates but no change in sodium current, which is aligned with their observations in a mouse model with a variant in SCN8A. Taken together, these results reveal mechanisms by which different epilepsy-related genes can affect heart function and SUDEP. Future research will investigate the impact of variants of a specific non-ion channel gene to see if it causes altered cardiac beating. Patient-specific iPSC cardiac myocytes are a very useful model to study SUDEP mechanisms and could be developed as diagnostic biomarkers to identify SUDEP risk in patients. 1 Cooper MS et al. Mortality in Dravet Syndrome. Epilepsy Res. 2016 Dec; 128:43-47. 2 Auerbach DS et al. Altered Cardiac Electrophysiology and SUDEP in a Model of Dravet Syndrome. PLoS One. 2013;8(10). 3 Lopez-Santiago LF et al. Sodium channel Scn1b null mice exhibit prolonged QT and RR intervals. J Mol Cell Cardiol. 2007;43(5):636-47. 4 Frasier CR et al. Cardiac arrhythmia in a mouse model of SCN8A Epileptic Encephalopathy. Proc Natl Acad Sci U S A. 2016; in press. 5 Frasier CR et al. Channelopathy as a SUDEP Biomarker in Dravet Syndrome Patient Derived Cardiac Myocytes. Stem Cell Reports. 2018 Sep 11;11(3):626-634.